This limited numbered edition (one of just 750) has been signed by the author, and remarqued with a full-page sketch, signed by Ed Miller. Synopsis : Journeys will take you to extraordinary places. From a changed Jerusalem to windmills which draw their own wind. From windswept British campsites to vast slave empires which have never been. MacLeod’s breadth of vision in this collection is extraordinary, but what unites these stories is his abiding interest in humanity, and the way in which he combines the fantastically strange and with the memorably everyday. Expect widescreen wonder in Journeys, with many surprising truths, and some dazzling writing, along the way. 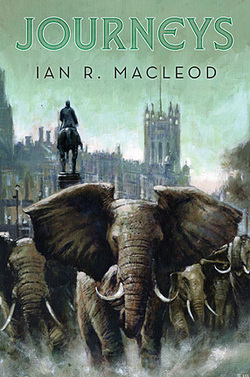 Despite a distinguished record as a novelist, which has recently won him both the Arthur C Clarke and John W Campbell Awards for his novel Song Of Time, Ian R MacLeod is probably still most widely known as one of the great writers of shorter fiction. He says that it’s still his own abiding love in the genre, and, after more than twenty years of writing, the area where he feels you can take the biggest risks, have the most fun, and make the biggest (and most entertaining) mistakes. MacLeod lives in the riverside town of Bewdley in England with his wife Gillian, and divides his time between writing, teaching, and trying to write. "MacLeod's stately, magisterial grace and richly textured prose may prove too much for readers looking for a quick fix, but the patient will be rewarded."